Though we still use its title as shorthand for the bizarre, dystopian times in which we live, a reboot of The Twilight Zone is a dicey proposition. Rod Serling’s classic genre-spanning anthology series has long been a standard-bearer for suspenseful storytelling suffused with social commentary—so long, in fact, that it’s already been reimagined on three previous occasions, including two TV revivals two decades apart and a 1983 feature film from Steven Spielberg, George Miller, John Landis, and Joe Dante. Try as they might, none of those iterations ever recaptured the unnerving magic of the original, not even when CBS, home to Serling’s series, took another stab at it in the ’80s. Black Mirror is a worthy enough successor, though its focus is a bit more narrow (mostly techno-nightmares) and its outlook far bleaker. Despite practically being embedded in the public consciousness, for TV creators and filmmakers, The Twilight Zone has proven to be an elusive destination to reach again. For its latest foray into the “dimension as vast as space and as timeless as infinity,” CBS has enlisted comedian-turned-director-and-Oscar-winning-screenwriter Jordan Peele as a guide. And talk about putting your best foot forward—if anyone can navigate “the pit of man’s fears and the summit of his knowledge,” it’s Peele, who’s indelibly established himself as a brilliant filmmaker and astute observer of the human condition. In 2017’s Get Out, he mined a relationship milestone for all kinds of tension, ultimately unmasking the new face of white supremacy with flair and humor. His second feature film, Us, which the director placed squarely in the horror genre, has set off a kaleidoscope of interpretations, ones that have undoubtedly been influenced by close readings of “Mirror Image,” the 1960 Twilight Zone episode that served as partial inspiration. 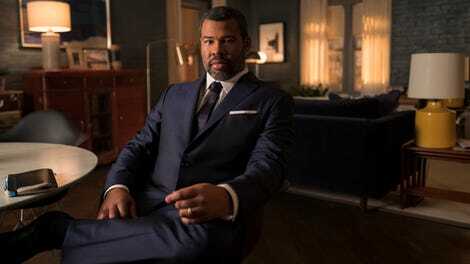 As the host and co-executive producer of the CBS All Access reboot, Peele has come full circle with The Twilight Zone. He slips readily into Serling’s former post on screen, evincing both world weariness and compassion for the subjects of the tales that are about to unfold. But one of several changes the reboot makes is to always place Peele in the settings for the episodes. At either end of an episode, he remains cool and wry, but also alert; just because one man’s run-in with a monkey’s paw has ended doesn’t mean the game is over. And like Serling, Peele’s host persona doesn’t seem invested in any one particular outcome; there’s a distance afforded by a multidimensional view of existence. The debonair, seemingly omniscient narrator isn’t the only element to carry through from the original series, it just happens to be the most consistent (along with an empathetic core). The Twilight Zone has had its ups and downs, both in its first five seasons and its previous TV revivals; though it often managed to seamlessly weave in its social critiques, the show could also be heavy-handed in laying out its themes. And though even some of the 25-minute entries could feel a little light on plot, the fifth season of the show’s first run doubled down on the meandering with 50-minute episodes. These same issues—overlong episodes and decreased nuance—also flare up in the reboot, with one installment encompassing them both. That would be “The Comedian,” one of two episodes that will make up the show’s first impression on April 1. 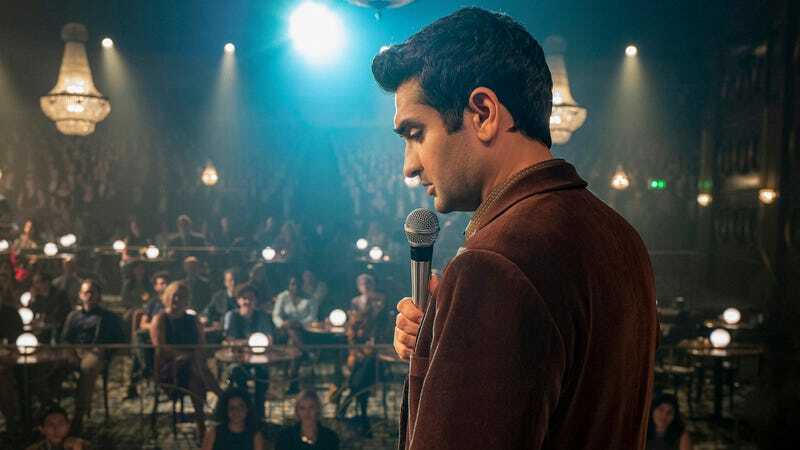 Starring Kumail Nanjiani, “The Comedian” is the story of a flailing stand-up who strikes a Faustian bargain with an established performer (Tracy Morgan) as if he’d never heard of Faustian bargains, which is presumably why he’s taken aback by the high price he pays for his end of the deal. The moral is highlighted early on, and then telegraphed at regular intervals over the hour-long runtime. Like Nanjiani’s comic, it loses its power with each retelling, yet former Key & Peele writer Alex Rubens’ script offers little else. Shoring up the reboot’s first impression is “Nightmare At 30,000 Feet,” which updates one of the best-known episodes from the original Twilight Zone. Written by The X-Files’ Glen Morgan and Daredevil’s Marco Ramirez, this new “Nightmare” stars Adam Scott as Justin Sanderson, an investigative journalist who’s still recuperating from a mental breakdown. Like the previous incarnations played by William Shatner and John Lithgow, Justin desperately clings to his sanity as the flight crew and his fellow passengers move around blithely despite seemingly impending danger. But instead of being bedeviled by a grotesque vision on a plane wing, Justin wrestles with his Cassandra complex, which he’s fed by delving into contemporary ills, including the purported loss of civility in the political discourse. Directed by Greg Yaitanes (Lost, Heroes), “Nightmare At 30,000 Feet” is appropriately disorienting—the design of the plane suggests the 1960s, but Justin is alerted to his doom by a true-crime podcast, which would place the episode squarely in the present. The twist likely won’t earn more than a nod of acknowledgment, but at roughly 28 minutes, “Nightmare” keeps the anxiety running high. The reboot does justify the longer runtimes as the season goes on. The wrenching and timely “Replay,” from director Gerard McMurray and writer Selwyn Seyfu Hinds, runs for over 45 minutes, but spans a few centuries of oppression for its central characters. Sanaa Lathan is riveting as a middle-class mother who endeavors to deliver her son (Damson Idris, reliably charismatic) safely to the historically black college he’s enrolled in, only to be pulled over, threatened, thwarted, and assaulted by a white police officer, who, when it comes to ensuring racial inequities, has all the tenacity (and remorse) of the T-1000. What pulls “Replay” out of the realm of a pointed drama is the camcorder Lathan’s character totes around; it has the ability to rewind time and give the family another chance to evade their pursuer. But as “Replay” observes, starting over again and again isn’t progress, certainly not when the jump-off point is much further back for black people. And even when progress is achieved, say, through class transition, it proves illusory. The Ana Lily Amirpour-directed “The Traveler” also traffics in inequality, xenophobia, and assimilation, with some reignited Cold War tensions thrown in for good measure. Morgan crafts what could’ve been a solid episode of The X-Files, but Amirpour makes “The Traveler” her own through cultural pastiche—Inuit and white American, animism and Christianity—and cinematography that turns every hallway and room in this remote Alaskan police station into a cell. Like Peele in Get Out, the A Girl Walks Home Alone At Night director treats tolerance as an outfit, a disguise, one that’s easily shed when it becomes too burdensome. The diverse cast includes Steven Yeun in the latest of his “this charming, diabolical man” roles, and Greg Kinnear as an avuncular bigot. “The Traveler” isn’t exactly innovative in its storytelling, recalling Stephen King just as readily as the case files of Fox Mulder and Dana Scully, but it is smart and moody. And, like every episode of the reboot so far, it boasts several great performances. That The Twilight Zone is a mixed bag, despite being under the auspices of one of the new masters of horror and suspense, isn’t that surprising—even if it were to retrace the exact path of the original, it would still suffer several missteps. The very nature of the anthology series allows for reinvention, and the reboot quickly regains ground after an uneven introduction. What’s most important is that the show’s ethos, one that was optimistic even as it shed light on another one of our foibles, remains intact. Disturbing and insightful, The Twilight Zone strips us of most of our bearings even as it offers a grounded center. Reviews by Noel Murray to run weekly.